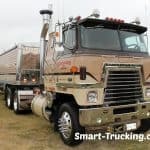 What Exactly is a Cabover Truck? Cabover trucks, COE (cab over engine), are essentially a style of big rig truck without a hood. The nose of the semi is flat and the truck cab sits on top of the diesel engine and steering axle. Because of the regulations for length, this style of rig was very popular in it’s day. The cabover style of truck took full advantage of the trucking industry length laws, in effect at the time. Placement of the truck cab over the motor saved some length. The overall length of truck and trailer, back then, could only be a maximum of 65′, from 1956 to 1976. They were tough to get out of after a long day of driving, and the ride in them was pretty firm. To get out, the trucker had to more or less, ‘back out of the cab door’, while hanging onto a railing on the door. Drivers had to be careful of ‘foot placement’, or else they’d end up falling on the ground! Anyone remember the TARZAN STYLE EXIT? The driver would grab the outer rail and swing out and down!It was easy for the younger drivers, but not quite so easy for the older truckers! There’s something very nostalgic about seeing these rigs on the road today.They are truly ‘special trucks’, and I think we’re going to see many more of them on the road, as truckers restore them to drive, to re-live some of the past. 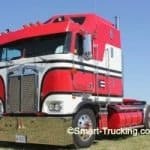 Why Did Cabovers Loose Popularity? In 1976, another 9′ of length was allowed, for a maximum 75′ allowance. So the length issue wasn’t so important anymore. 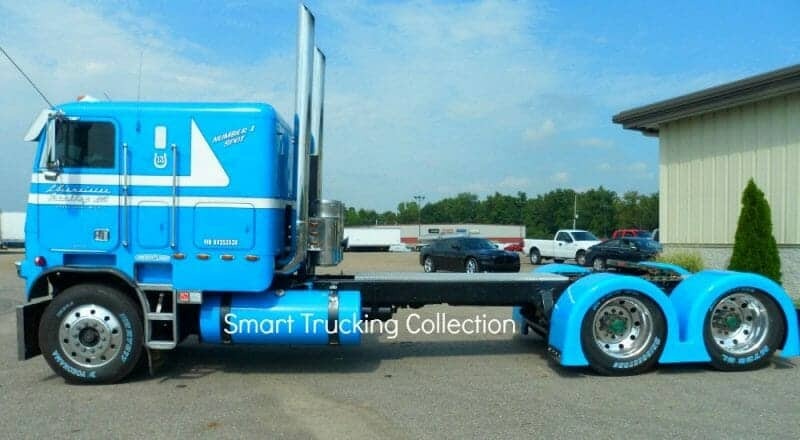 The large carriers who were the big buyers of cabovers, switched over to the conventional style rig, and the bottom rapidly fell out of the market for them in North America, thus the fall in popularity of these trucks. The cabover truck design is outdated for the North American highway infrastructure. But they are still the gold standard in Europe, Australia and Japan. Truck manufacturers in these countries still make this body style as their lengths laws are still quite rigid, and the cabover style allows for trailer length to be maxed out. Class 8 cabover highway trucks are still manufactured at a plant in North Carolina. 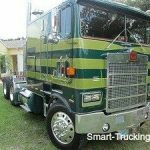 Why The Nostalgia For the Cabover? These rigs were once quite commonly seen rolling down the highways. But now a sighting of a working cabover truck on the road is more rare. 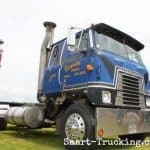 However, I’ve noticed a resurgence of interest in cabover trucks recently. I’ve seen a number of really nice ones, rebuilt and re-finished and restored back to new condition. This retro truck style is rising to the surface once again for particular working applications. They are also becoming wildly popular at truck shows. It’s great to know so many truckers still appreciate these trucks. Many memories are attached to the old cabover trucks models. Many truckers and retired truck drivers alike, lament about the classic cabover truck models, that once ruled the highways of North America. The cabover truck is an icon. 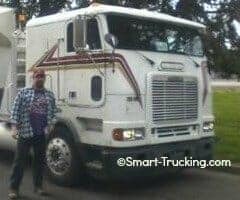 It represents the days of trucking we all long for, in today’s world of trucking, that is so muddled up and complex with it’s mounds of unnecessary rules, regs and guidelines. 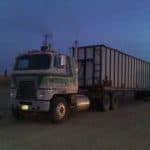 These old school cabover trucks, whether Kenworth, Peterbilt, Freightliner, White, GMC, Ford, Diamond Reo or old Crackerbox, meant freedom, simplicity, open roads, good memories and yes, some back aches. 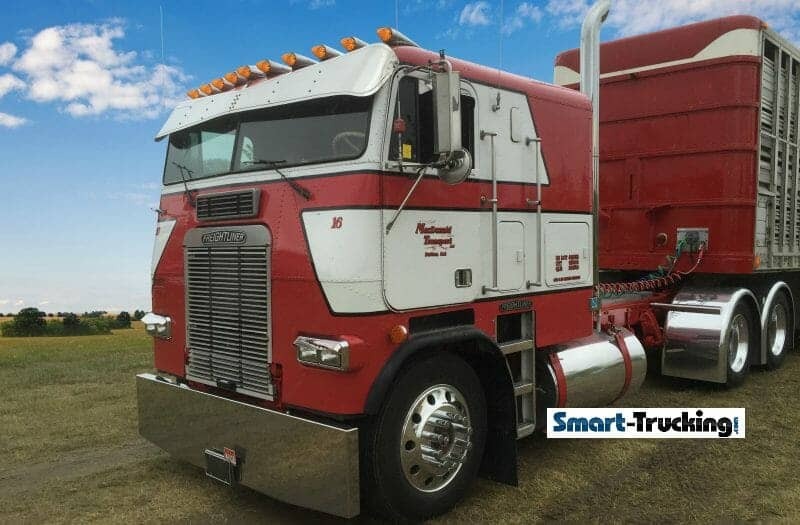 They bring back good memories from the past from the days when the industry paid truckers what they were worth and the professional driver was respected by the public. Here are some comments sent in from truckers. 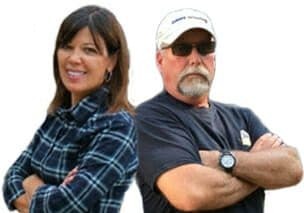 A few words about their personal connection and memories of cabovers. My Dad drove so many of these, his knees still rattle and shake! Oh man, how I love those old cabovers and the other rigs, especially the Petes. Even the old freight shaker cabovers! When I was a kid, my parents would drive me to the nearest truck stop, so I could take pictures of the big rigs, and talk to the truck drivers. Most kids wanted to go to the beach, but my favourite thing was to head for a truck stop! Those old White Freightliners would just rattle all the time. Never tripped across one that didn’t rattle! No wonder they were called ‘Freightshakers’! 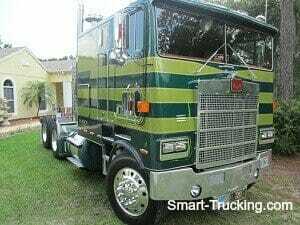 I would sleep across the doghouse in my cabover. As a mechanic, I spent a lot of time working on this style of truck. Just love the old school rigs. Drove these trucks for years. But no more please, too uncomfortable. The first 1,000,000 miles of my driving was in trucks like these. I grew up in a cabover. Loved it when trucks had ‘real character’. These rigs are ‘true classics’ for sure. It’s too bad they don’t make them like that any more. My first truck was a 1981 COE. I drove one in ’71 for two years, with a V12 Detroit engine. It was truly a great truck. These gems were a challenge to drive without power steering. When I was bob tailing, and would hit a bump, I’d have a new dent in the headliner. Truck had more than a few dents! 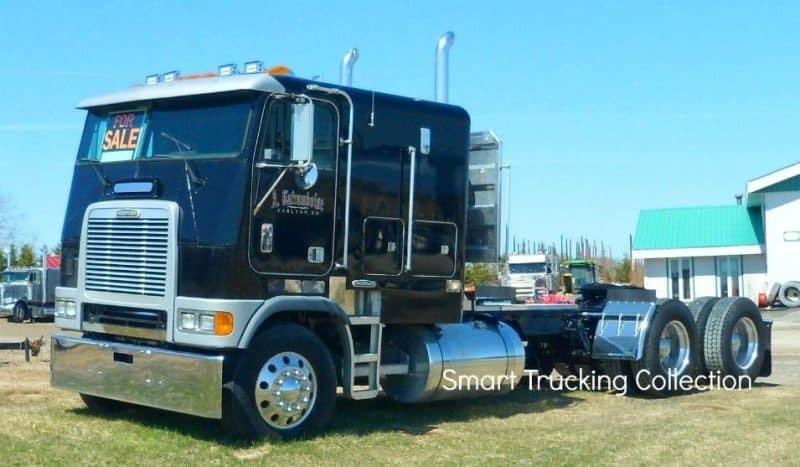 Especially love the old Kenworth K100E Aerodyne. My Grandpa and my Dad owned several of them. The best trucks ever. Man, those old cabover trucks were ‘back busters’. I drove a COE for the first ten years or so of my driving career. They were great for maneuvering in tight spots, but not so great to live in for long time periods for over the road trucking. It was hell. It was pretty tiring crawling in and out of it and having to lie down to get dressed! Super trucks for local work, but not well suited for long haul trucking. I first learned to drive in a cabover. Aahhhh yes, I spent many a day in these. Heck, it reminds me of the good old days when there were way less laws and regs. Cabovers weren’t necessary dangerously. That was all there was to drive at one time. They were legal and they got the job done. They were quite safe if they were driven with respect. Drivers didn’t worry about ‘head on’ collisions. Drove them back in 88′ when I started driving with Schneider National. I love the old KW100E. I’d give anything to have one now. Just love the old school classics. They have a special look. 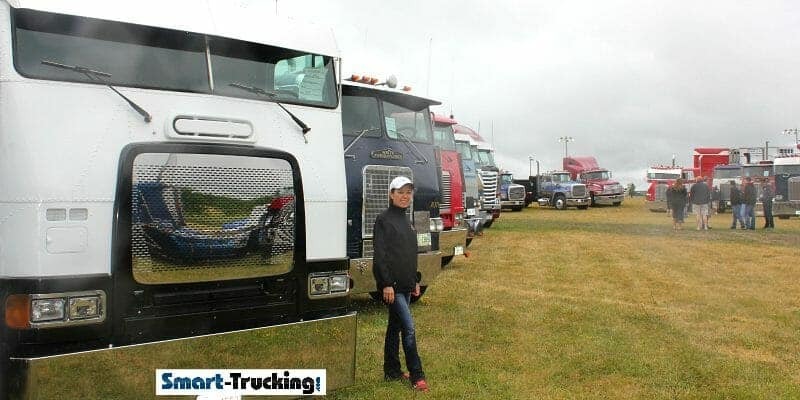 At SMART TRUCKING, we’re also avid fans of the cabover truck. We like the way they roll. Visibility. The simple fact that these big rigs didn’t have a hood, created better visibility for the driver. There are fewer blind spots too. Cabovers had great visibility and they had the look of highway trucks, due to their sheer height. Maneuverability. This style of old semi trucks are incredibly maneuverable. When backing in to loading docks and winding through heavy traffic, nothing can compare with a cabover truck! The shortened wheelbase allows for this tight turning radius. 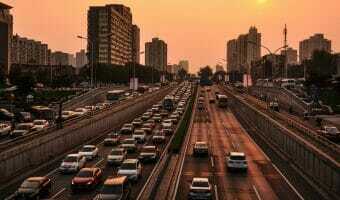 For this reason, they are still popular in Europe, where the roadways are generally narrower, with tight clearances, and even more congested than in North America. The Sleeper Bunk. To get in the sleeper bunk the driver of the rig must crawl through a hole. 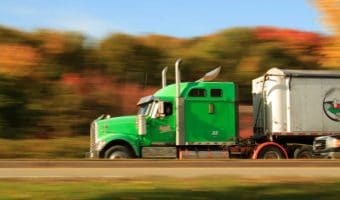 The trucker literally must stand up on the seat of the truck and crawl over the engine, which is positioned between the seats! 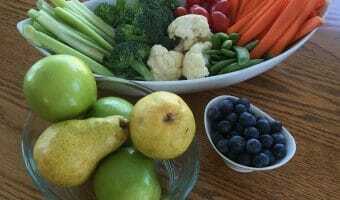 Anytime the driver wants anything from the bunk, the process is the same…. 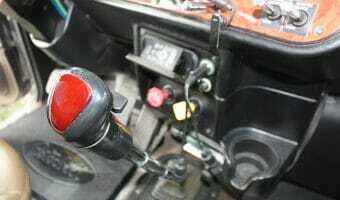 there is no reaching into the sleeper to grab something, when sitting in the driver’s seat! Highly inconvenient. Comfort. Cabover trucks weren’t particularly comfortable, back in the early years. Many truckers complained that the ride was pretty rough, mostly due to the shortened wheelbase. Comfort is a big issue especially for long haul trucking. 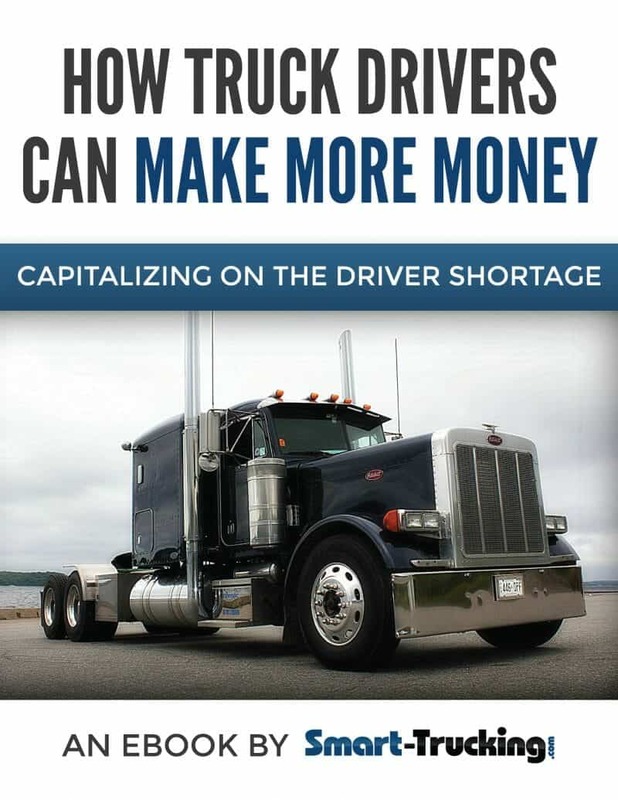 When the truck manufacturers decided to increase driver comfort in these trucks, their price increased as well. Their sales as a result, started to dwindle, as a conventional style rig was almost the same price as these flat nose trucks, and they were considerably more comfortable. The early COE trucks were also very cold, as they weren’t well insulated. In fact they were as cold as hell! Noisy. They were also louder than long hood rigs, as the driver was sitting right above the engine! Maintenance and Repair A cabover is repaired by tilting the entire cab forward. This gives good access to the motor for maintenance and repair. However, there was a downside that accompanied this accessibility…. when the cab was tipped, anything and everything in the truck and sleeper berth that wasn’t glued down, would fall onto the windshield of the truck! Safety A cabover rig isn’t as safe as a long hood rig, in the event of an accident, as there just isn’t any protection for the driver. The driver would be the first guy at the scene of a head on accident. They were deadly in a head on crash. Modern cabovers are built with more structural safety features to protect the driver in the event of a crash. However, the conventional long hood vehicle still fairs better in an accident. The Internationals were good solid trucks. The Kenworths had dog houses big enough to sleep on. The Peterbilts were big and luxurious. The Freightliners could be as cold as the Arctic, even with the heaters on full! Some truckers wore full length snowmobile suits in them, just to stay warm! Ford made a big cabover on air bag suspension that leaned in the corners and felt like it was going to tip over sideways when the driver climbed in or out. GMC Astro had a windshield that seemed to come down to knee level! It was like driving a bus! 1982 Marmon COE – A 110P, with the rare option of a V-grill and V-bumper, which is known as the VIP package. It’s powered by an NTC 400 Cummins, 15 speed, 433 ratio with dual air breathers. This is a highly detailed restoration of the exterior and the interior. Restoration completed recently. Owned by Ryan Wichtner, FL. 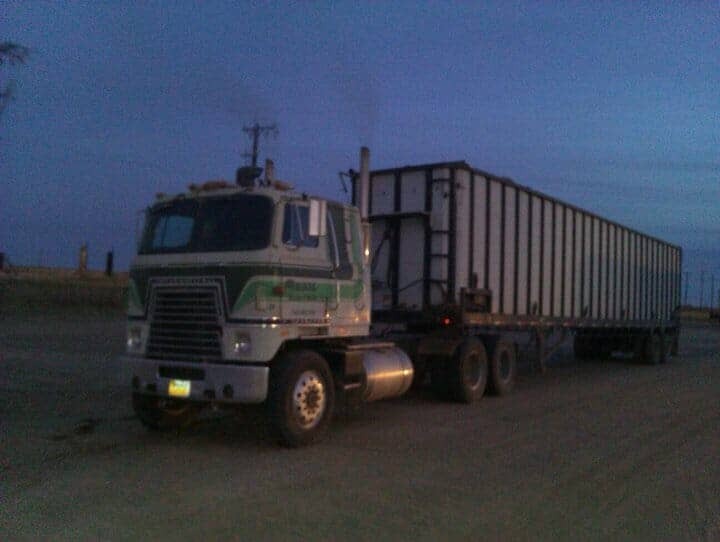 1974 Diamond Reo Cabover – An early model of COE style rig American made. These trucks were as tough as nails! This 1974 model was one of the last trucks to travel down the assembly line before the company went bankrupt in late 1974. 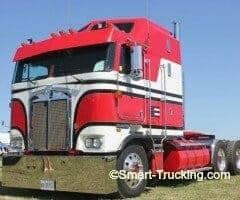 1985 Kenworth Cabover, K-100 – Kenworth release the first of their cabovers, in 1955. 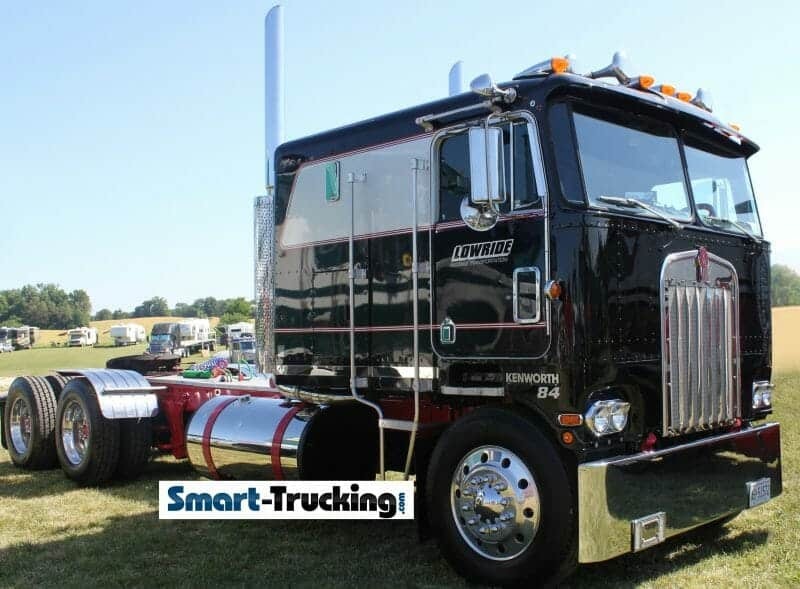 The Kenworth cabover, better known as the ‘bull nose’, was built with comfort and driver safety in mind. Some models had quite large sleeper berths. 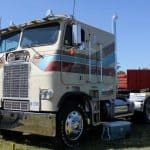 1985 Cabover Kenworth, K100 – This Aerodyne model of COE, was one of the best looking of the cabovers. Resale on these still seems to be excellent! A popular model of truck, with COE fans, and with a following and some ‘clubs’ across North America. 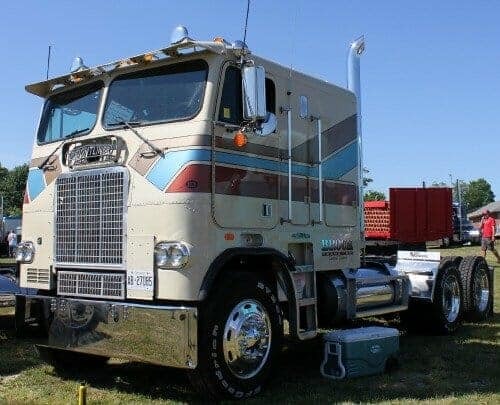 1979 Peterbilt, 352 Cabover – This Peterbilt has been beautifully restored by it’s owner! This model was designed to have a higher cab, bigger rad, and a larger engine, than it’s predecessor. 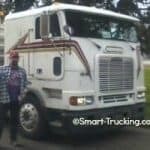 1995 Freightliner C.O.E. – A 60 Detroit and a 10 speed trannie under the hood. It’s been stretched, and also has a tag axle. She carries weight between 93-105,000+lb loads. 800,000 miles, and a rebuild. International Cabover – A 1974 model, powered by Cummins 400, 13 speed transmission, owned by Mark Johnson.